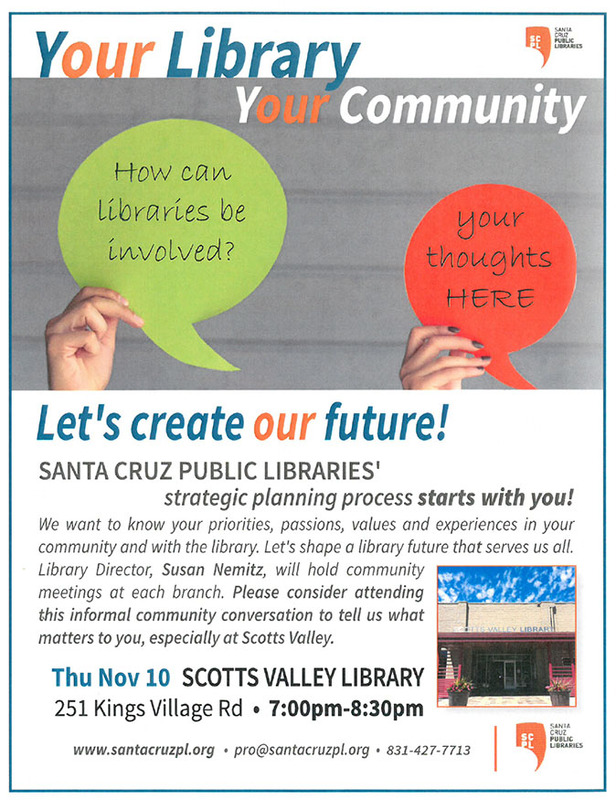 October 6, 2016—SANTA CRUZ, CA—The Santa Cruz Public Library System (SCPL), a network of 10 neighborhood library branches throughout Santa Cruz County, today announced a series of meetings to be held at each branch library to obtain community input on an updated strategic plan. In addition to each of these Branch Meetings, library staff are also participating in conversations with individuals, groups, and organizations to gain input. This information, combined with benchmarking studies against other California Libraries, demographic and other data analytics, will be analyzed in preparation for the written plan. The 2017-2020 Strategic Plan is expected to be complete in January. The Santa Cruz Public Libraries (SCPL) system delivers information, education, enrichment and inspiration through a network of 10 neighborhood library branches, a web-based digital library, a Bookmobile and community-based programs. SCPL serves children, teens and adults with innovative programming, professional services and community facilities that spark imagination and support discovery. Residents can explore a wide range of interests from academic research, book clubs and literacy programs to digital photography, locally-produced music and local history. Branch locations include Aptos, Boulder Creek, Branciforte, Capitola, Downtown Santa Cruz, Felton, Garfield Park, La Selva Beach, Live Oak and Scotts Valley. 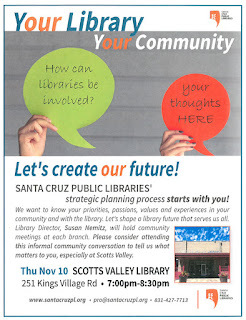 Learn more about SCPL at SantaCruzPL.org or via Facebook, Instagram, Pinterest, Twitter and YouTube.